• About Us - Dotto kisvonat Tihany • Dotto kisvonattal városnézés Tihanyban! A Dotto vonatok 20 éve járják a tihanyi félsziget útjait. A kisvonat évről évre egyre népszerűbb, hiszen a vendégek könnyen és kényelmesen utazhatnak a Dottón Tihany látnivalóihoz, nevezetességeihez, vagy éppen a szálláshelyükhöz. 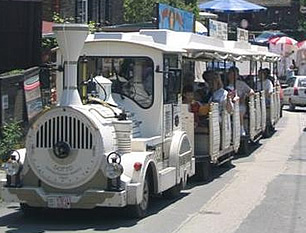 The Dotto road train is specifically designed for operation in tourist areas and to suit European requirements. It offers flexible and diverse use in tourism. 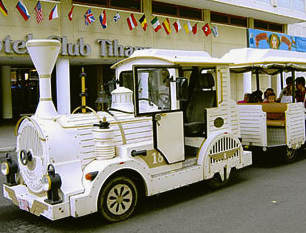 This leisure transport solution is fabricated with the latest technology; it ensures 100% safety in high-density areas. It is a unique contrivance; all coaches follow precisely the path of the engine and the preceding coaches making them eminently safe in crowded areas. Its design, mobility, manoeuvrability, environmentally friendly construction, efficient operation have made the Dotto trains INTERNATIONALLY ACCLAIMED. They have become the TOURISTS' FAVOURITE because of the pretty design, the information transmitted through loudspeakers, undisturbed photo taking and its capability to operate on winding, narrow roads and gradients up to 15-20%. Tihany is the only peninsula of Lake Balaton and besides geographical features, it is famous for archaeological findings and also has many historical interests. The ferryboats taking cars and buses start from the southern shores of the peninsula. Tihany is also the name of the village located on the top of the hill; the popular holiday resort has approximately 1300 inhabitants. The much told Echo of Tihany, which return from the wall of the abbey building, can be enjoyed by the tourists especially in windless, quiet evenings. There are also a lot of events and programmes during the summer in Tihany. The Tihany Festival (Tihanyi Ünnepi Játékok) is held on the Open-air Theatre on the shore of the Inner Lake (Belsõ-tó) from July until the middle of August. The organ concerts, held in the Abbey Building, are famous throughout the country. The Tihany Vintage Days are held during the first half of September with music, folk dance, comedies and street ball. Well-equipped ports are at the disposal of the lovers of sailing, while the Inner Lake is a favourite fishing spot. 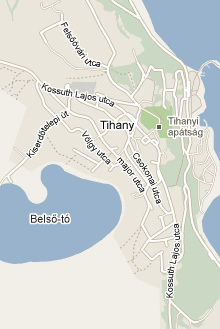 The whole area of Tihany peninsula is a nature reserve. The south-western shoreline of the peninsula preserves its natural state in the Bozsai Bay, which is one of the last almost undisturbed reed bays of the Lake Balaton. As a result of volcanic follow-up activity, thermal springs created more than one hundred geyser hills in the peninsula. Címsorszöveg: About Us - | Dotto kisvonat Tihany | Dotto kisvonattal városnézés Tihanyban! A Dotto vonatok 20 éve járják a tihanyi félsziget útjait. A kisvonat évről évre egyre népszerűbb, hiszen a vendégek könnyen és kényelmesen utazhatnak a Dottón Tihany látnivalóihoz, nevezetességeihez, vagy éppen a szálláshelyükhöz.